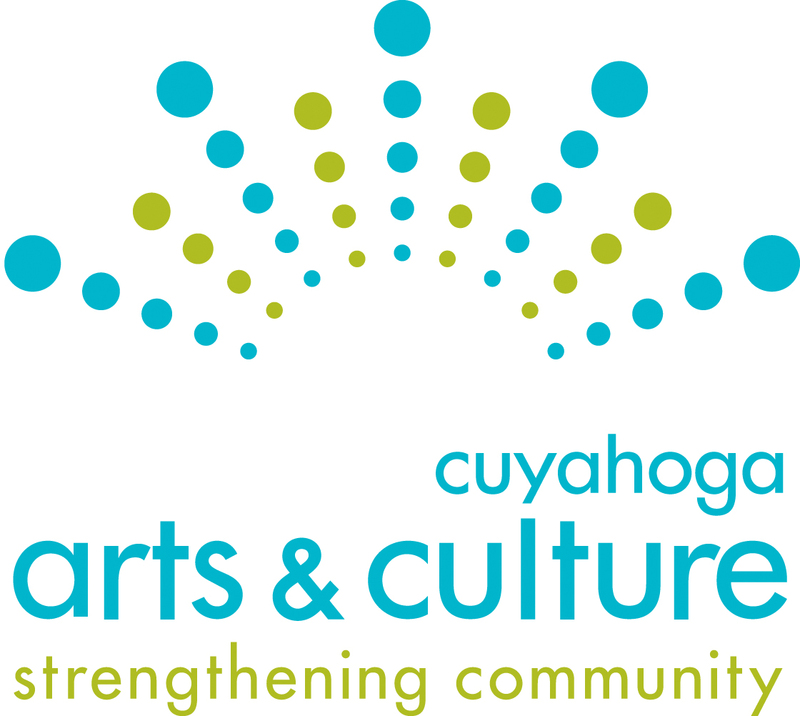 The Waterways to Waterways cohort of Creative Fusion residents continues a long tradition of artistic response to the Cuyahoga. The general lay of the land surrounding Cleveland offers little drama to feed either artists’ or tourists’ desire for the extraordinary. Even the coast of our Great Lake offers little variation—with none of the outcroppings, peninsulas and offshore islands that usually inspire the artist’s brush. Our most significant rise of land, the Portage Escarpment (which marks the rise of the Appalachian Plateau from the midwestern central lowlands), is clearly visible at Cedar Hill above University Circle, or from I-77 just as it reaches Independence, but even that would miss notice among the mountains of Pennsylvania or Virginia. So, in Northern Ohio artists have historically sought inspiration from the relative grandeur that we have—valleys cut into the surrounding plateau by our rivers. The Cuyahoga River created the largest and most dramatic of these valleys, and it has always been a place set apart from the general uses of land in our region. For ten thousand years before European contact, indigenous people lived, worked and crafted near the Cuyahoga—from the floodplains to the tops of the shale cliffs. But although significant examples of their more durable tools survived the white settlement that leveled mounds and scattered caches, decorative and ceremonial artifacts are harder to come by. We have, for example, suggestive imprints of textiles and basketry pressed into wet clay by Woodland potters before the vessels were fired. But the colors and the patterns of the artworks that left these impressions have vanished. In the early years of European-American settlement, the valley was used with caution. With abundant, gently rolling, well-drained land, and with the probability of floods and the certainty of mosquito-borne diseases in the river-bottoms, settlements were established on higher ground. While the valley was farmed, those farms were isolated from the rest of the community. The 1827 opening of the Ohio and Erie Canal from Akron through to Cleveland brought dramatic changes. The harbor at Cleveland grew to be a port of national importance as the agricultural bounty of Ohio passed through on its way to New York. The flat lands along the river bustled with warehouses and industrial enterprise. Cleveland’s imagining of the Cuyahoga River Valley has always been dynamic, with shifting points of view, and divergent ambitions. Over time, as the canal traffic moved to railroads (the canal closed in 1913), and as farming declined in the region, the valley came to be used primarily for an odd coupling of industry and recreation. The valley has seen the beginnings of the American oil industry, the heroic and monumental structures of the age of steel, the occasional fires on its river, and the creation of a National Park. The first artist known to create a body of work that contained a number of images of the Cleveland Harbor and adjacent hillsides was Otto Bacher (1856-1909). In the late 1870s, as he was preparing to go to Europe (and to develop there a reputation for his etchings of Venice), he created prints of the Cleveland of his time. Almost wispy and certainly romantic, there’s an edge of picturesque decay, as well as of industrial muscle. In the early twentieth century, Cleveland was booming, but before the full ascendancy of the automobile, urban density ended with the last stop on public transportation lines. A number of artists enjoyed maintaining contact with Cleveland’s cultural community while also enjoying the pastoral valley. John Semon (1852-1917), an art teacher at the Western Reserve School of Design and later a private instructor, was an early teacher and inspiration of the painter Marsden Hartley. Also was a hermit of sorts, he retired to the forests of Bedford to paint the wooded river bottoms near Tinker’s Creek in a French Barbizon sort of way—all thick golds and darkened shadows. Frank N. Wilcox (1887-1964) was born in Cleveland and his life was of a city boy, but his identity was also defined by weekend, holiday, and summer visits to his grandparent’s home in Brecksville. Their farmland intermingled with the down-slope ravines and dipped to the valley floor. He was thirteen when his father died, and the family moved to modest circumstances on the near west side. Many of his early etchings were of the shacks tumbling down Dutch Hill, on the southern edge of Tremont. Much of his work was of an idealized rural Cuyahoga valley of his childhood, of day-to-day chores, of canals and Indian trails. Cleveland’s great early modernist, William Sommer (1867-1949), for many years lived in Brandywine, near the landmark falls that is now in Cuyahoga Valley National Park. Hart Crane, ground-breaking poet, came to visit and to be inspired, and wrote two poems about Sommer. Charles Burchfield (1893-1967) also made the pilgrimage to Brandywine, recording with a view of the falls and also of a visit to Bedford Glens along the way. Sommer had lived for most of his life in an urban environment, in Detroit and Cleveland, but his magical years were in the 1920s, as he painted the valley life that surrounded him. Responding to renewed interest in painting of local landscapes and encouraged by Cleveland Museum of Art Director William Milliken’s advocacy of finding subject matter in the place where you live, Carl Gaertner (1898-1952) best painted the drama and magic inherent in industrial process, proportionally measuring the human and factory scale, contrasting snow and fire and the bare welcoming light of a pie wagon enticing workers after their shift. Between the 1940s and the 1960s, artists turned their attention from regional flavor to both the formal and expressive possibilities of abstraction. In the 1960s figuration was being re-invented nationally and internationally. In Cleveland, a post-war generation began to respond to the city and its river, and perspectives emerged that re-invented the river and its bridges as a core component of its identity. In 1966, William Donahue Ellis’s book, The Cuyahoga was published as the 58th in a decades-long Rivers of America series. Popular through multiple printings and editions, the book was illustrated by Kinley Shogren (1924-1991), in relatively spare black and white. Shogren became best known for his detailed and lavish paintings of Great Lakes shipping, as well as images of both the industrial mouth of the Cuyahoga River and bucolic scenes upstream. After debris and other material on the Cuyahoga River burned famously in 1969, it became an icon of the environmental movement, not so much because of the environmental disaster—damage was relatively modest—but because it had the resonance of spectacle in the early years of the popularized environmental movement in America. A few years earlier, in 1962, Rachel Carson’s Silent Spring was a call to arms; the first Earth Day was not so long after, in April of 1970. Even as much as the news of a burning river became a focus of international environmental activism and a punch line for late night television comedy, in Cleveland the popular culture responded with a certain amount of twisted pride. An alternative tabloid newspaper bore the nameplate Burning River Oracle, and entrepreneur Daffy Dan created an iconic t-shirt with the image of a pollution-choked city and the slogan “Cleveland, You’ve Got to be Tough.” Now, “Burning River” labels are on everything from a beer to a brass ensemble to CrossFit trainers. As a painter, levy aspired to create frescos on the sandstone pillars of the Lorain-Carnegie Bridge. His request for permission was declined. By the mid-1970s artists were moving into inexpensive empty spaces in the Flats. Ron Dewey (born 1934) opened a studio foundry on Old River Road on the east bank. Clarence Van Duzer (1920-2009), a sculptor and painter and longtime faculty member at the Cleveland Institute of Art, built a home and studio on the banks of the Cuyahoga, grey-brown as the river and monumental and fortress-like as many of the nearby industrial buildings. On the west bank (sometimes branded as the Left Bank), Joe Scully and Tom Newman purchased a building on Riverbed, and rented spaces to artists and writers. Scully fashioned wrought-iron balconies overlooking the river for each studio, often in reflection of the work of the artist. Partially identifying as artists and partially as urban guerillas, a loose association called themselves the “Regional Art Terrorists” with noms de guerre such as May Midwest and Flatz Ratz. In addition to their personal work, they created unauthorized public pieces, timing their work on a mural along the Rapid Transit line between passage of trains in the early morning hours. “In the place by the river there were pipes from an organ. If you blew on them, one long and two short, you could make the lift bridge go up. “‘You have an empty billboard by your window,’ he said sadly. ‘What are you doing tomorrow night?’ I said, gently. Art exhibitions (and their catalogs) of the following decades explored and documented a need to understand the urban, industrial environment, and in them the Cuyahoga River featured prominently. Notable among them were American Realism and the Industrial Age, Cleveland Museum of Art, 1980 (Marianne Doezema, curator); Local Flavor, Cleveland State University, 1983 (Mary Jo Bole, curator); The American City: Unbending Walls and Shadows, Cuyahoga Community College, 1984; Responses to the Urban and Industrial Landscape: Photography and Sculpture, Kent State University, 1989 (Penny Rakoff and Fred Smith, curators); and Urban Evidence: Contemporary Artists Reveal Cleveland, Cleveland Museum of Art, Cleveland Center for Contemporary Art, and SPACES, 1996 (Susan Channing, Julie Fehrenbach, Tom Hinson and Gary Sangster, curators). Art featured included Mary Jo Bole’s massive earthenware platters of the river’s industrial flow, Wenda Von Weise’s photoscape quilted fabrications of bridge and ore boat, Andrew Borowiec’s precise and expansive photographs of elegance and abandonment, Laila Voss’s catch-all nets of debris from the Cuyahoga’s shore, and Don Harvey’s elegant ink-on-rice-paper drawings of coal piles and factories. 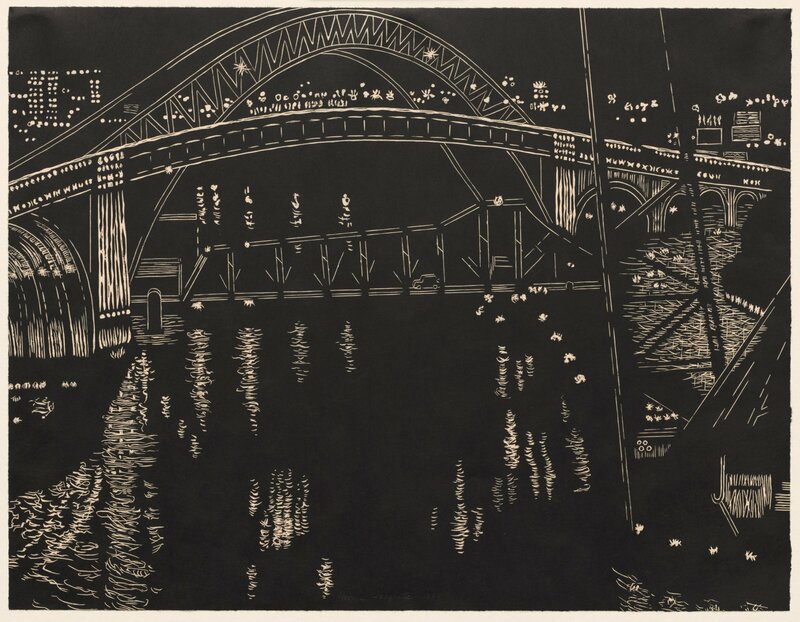 Since 1924 the Print Club of Cleveland, an organization that supports the print collections of the Cleveland Museum of Art, has published an annual print. Four of these editions referenced Cleveland’s urban landscape. 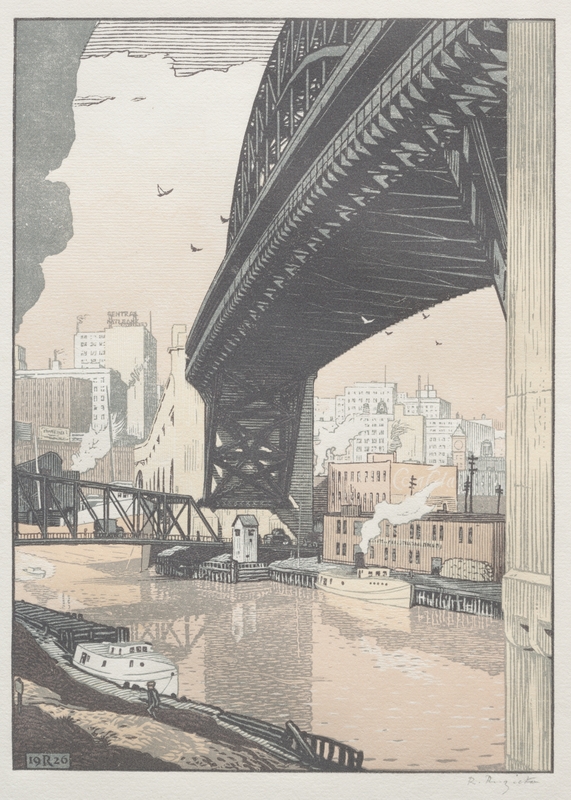 Three featured images of the Cuyahoga: Rudulph Ruzicka, High Level Bridge, edition for 1926; Yvonne Jacquette, Bridges over Cuyahoga River, edition for 2000; Laurence Channing, Burning River Intaglio, edition for 2001. When Laurence Channing (born 1942) first exhibited his views of Cleveland in 1991, many were surprised by his achievement of realism in charcoal on paper. Since then, however, his work has taught us more about how we perceive place through light and shadow—and how important are our shades of grey. Much of his imagery is of the bridges and factory buildings of the Flats. His work dazzles with precise edge and ethereal beauty. 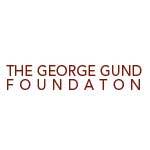 Since 1990 the George Gund Foundation has commissioned a photographer to create a portfolio of images of a “priority or area of interest” for its annual report. 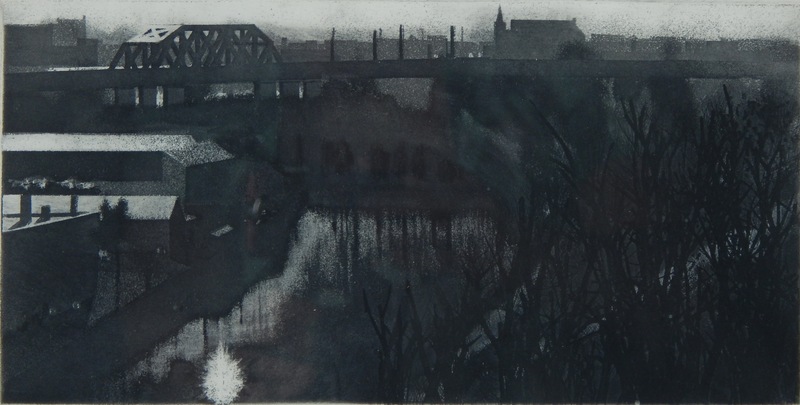 The work of four of these artists has largely or wholly been of the Cuyahoga or its valley: Lois Conner, Cuyahoga River (1991), Andrew Borowiec, Industrial Landscape (2002), Geoffrey James, Cuyahoga Valley National Park (2005), and Jeff Whetstone, Cuyahoga River (2012). 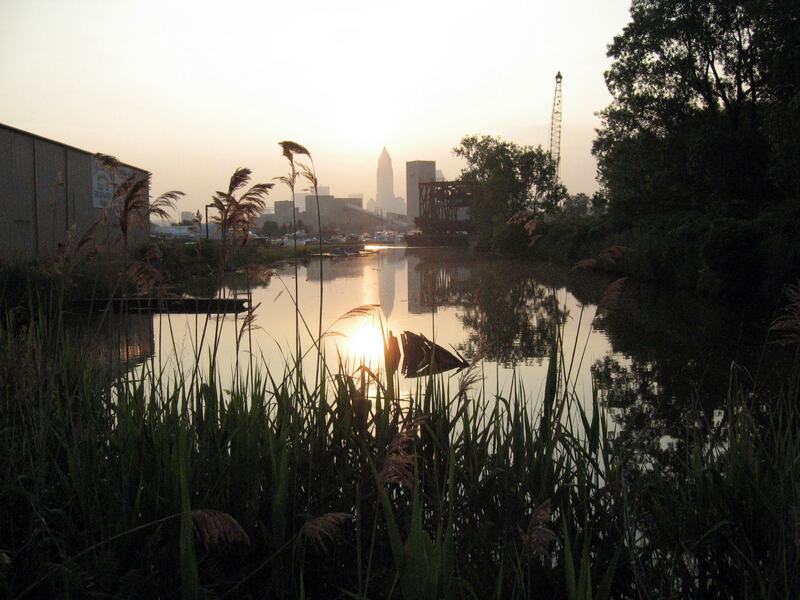 Taken together, these portfolios in style and subject sum the present and potential of the lower Cuyahoga from Akron to Lake Erie: natural, domesticated, industrial, and abandoned. And, of course, the images are simply wonderful. There is a significant difference between pictorial views of Cleveland in the 1920s and 1930s and in recent years—the decades since the last fire on the Cuyahoga. Artists are much more likely to portray the river and its environment than neighborhoods or commercial center. There’s an intuitive sense that the river is the heart of the city—marking cultural differences which divide, and spanned by bridges which unite.